Deadpool is crazier than a sack of ferrets but he still maintains a code of conduct that sets him apart from less scrupulous mercenaries. When it comes to gratuitous violence and genuine heart, Deadpool is in a class all his own. In fact, it's not unreasonable to say that Deadpool, as both a character and a concept, goes out of his way to stand out and isn't afraid to be obnoxious about it. Regardless of whether his name and design was derived from Deathstroke, he's someone who does more than most to stand out in a sea of Wolverine, Superman, and Batman rip-offs. Thanks to two successful movies -- Tim Miller's Deadpool (2016) and David Leitch's Deadpool 2 (2018) -- and the inherent likability of Ryan Reynolds, Deadpool's star has never burned brighter. It's safe to say that in this character's efforts to stand out, he has succeeded. His mask, his tumor-laden face, and his propensity to break the fourth wall are now every bit as iconic as Wolverine's claws or Captain America's shield. He has nothing left to prove. He's earned the right to brag and gorge on all the chimichangas he wants. As much as he's achieved as a character, Deadpool always finds ways to stay busy and entertain. Most of those ways still involve the kind of destruction and vulgarity that would get most characters fined by the FCC, but he never does it out of pure malice. He's not Sabretooth, Norman Osborn, or Dexter Morgan. He's crazier than a sack of ferrets but he still maintains a code of conduct that sets him apart from less scrupulous mercenaries. Those who undermine that code are likely to be on the wrong end of Deadpool's guns, katanas, and toilet humor. That's both the setup and the appeal of Deadpool: Assassin #1. 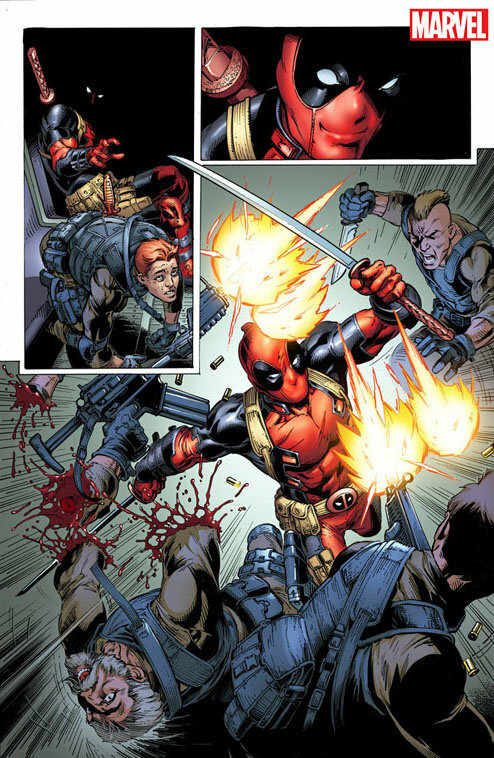 Cullen Bunn and Mark Bagley put Deadpool in a position to further set himself apart by showing that there's merit to having a code of conduct as a mercenary. That process involves a hefty bit of bloodshed and mayhem, but anything other than that just wouldn't be true to Deadpool's increasingly powerful brand -- and he does plenty to maintain his brand in this story. Bunn and Bagley don't try to reinvent the regenerating degenerate. They just put him in a situation where he can do what he does best, which means being in close proximity to far less ethical mercenaries and evil ninjas. For Deadpool, that's like mixing chocolate and peanut butter, but with several extra sides of carnage and bloodshed. It's every bit as potent as it tries to be. These crude but colorful basics give Deadpool: Assassin #1 plenty of entertainment value. However, there are some other side-plots thrown into the mix that keep it from being a generic story about a Deadpool-centric shooting spree. One involves Deadpool's old friend Weasel, whose life has taken a far more domestic turn. He still works with Deadpool and still provides him with plenty of opportunities to shoot things, but he's got other priorities. In revealing those, Deadpool himself reveals something striking and potentially profound. Being so unhinged and eccentric, Deadpool never comes off as one of those guys who plans for a simpler future that doesn't involve as many explosions. Between his skills as a mercenary and his fourth-wall breaking awareness, he rarely shows interest in settling down, retiring, or taking up a hobby that doesn't require heavy firearms. Indeed, Deadpool operates on a moment-by-moment basis, going from one job and/or wisecrack to the next. While he may occasionally mix things up by joining the X-men or marrying a succubus, Deadpool still acts primarily on an impulse. Even with the limited ethical standards by which he operates, he's not known for his foresight any more than he's known for his choice of underwear. Wherever there's violence to be had, he tends to gravitate towards it. With an unstable mind and a body covered in tumors, that's kind of how he has to be. That's what makes his admission that he's getting bored with mercenary work so striking. He still makes clear that he loves killing unscrupulous mercs and ninjas, but that's not enough for him anymore. He claims he's only doing a few more jobs before he moves on to something else. It's not clear how serious he is. It's like Peter Parker saying he doesn't want to be Spider-Man anymore, but that sentiment goes away the second he has an excuse to change his mind. Unlike Peter, though, Deadpool isn't known for responsible decision-making. That makes the plot surrounding Deadpool's changing priorities seem tentative, at best. Nobody, fictional or otherwise, can buy that he wants to retire to his own tropical island and sip margaritas for as long as his healing factor allows him to live. He gets bored too easily, enjoys dangerous surroundings too much, and makes too many impulsive decisions. While that makes his antics fun to watch, it also makes any effort to settle down less believable. To some extent, Weasel's situation reflects that. He's no longer a former Hydra agent who just happens to be friends with an unhinged mercenary. He's got a stable job, a wife, and an overall easier life that involves less killer ninjas and more credit card bills. It's less hectic, which Deadpool claims to want, but Weasel never gives the impression that it's very fulfilling. If anything, he sends the message that settling down can make a man feel domesticated. This doesn't impact Deadpool's intentions or his ninja-fighting skills, but it does throw shade on the idea that seeking a less damaging occupation comes at a cost. It also establishes that if Deadpool really does attempt to hang up his katanas and guns, he'll end up changing his mind faster than Peter Parker ever did. Long-term intentions aside, Marvel Comics still provides plenty of value in terms of giving Deadpool fans what they want. Bagley's artwork makes it colorful while Bunn's dialog makes it witty. It checks all the necessary boxes for a fun, engaging Deadpool story. It tries to do more and while it lays a foundation, it doesn't offer much in terms of clues. 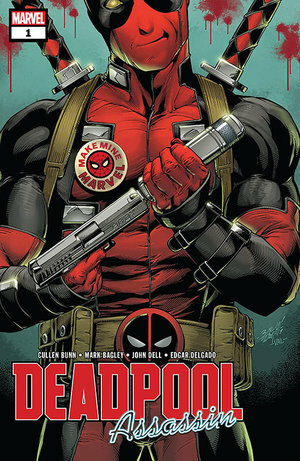 He's still doing mercenary work, as only he can, but what does someone like Deadpool do when he wants to move onto a new endeavor? That question goes unanswered in Deadpool: Assassin #1. More than anything, this comic puts Deadpool in a position to mix things up again. This probably won't result in him getting a job as a tax attorney or a janitor, but if it leads him to novel forms of violence, then it can only help the potty-mouthed merc in his never-ending struggle to overshadow Deathstroke.